Made of industrial aluminum material, durable and hardness. Combines a radiator cap with a temperature gauge. Measure coolant temperature to tell if it is safe to open the radiator cap. Prevent leakage while adjusting the pressure balance for the water tank to keep the water level balance. With silicone seal for better adaptation, 100% won't leak. Direct bolt-on installation. Free you of the worries of engine damage by high water temperature. SIZE: Diameter of Head: 43mm; Diameter of Top Rubber: 13mm; Diameter of Middle Rubber: 25mm. Suitable for offroad cars, motorcycles, engineering vans. This radiator cap is designed with water temperature gauge, which shows whether it is the safe temperature to open the radiator cap. It is easy to install. Just take the old cap out, and bolt on this new one. ￭With the increasement in water temperature, the cooling water begins to expand. Once the pressure exceeds the release pressure (0.9KG), the water tank cap string will open and let the cooling water flow to the subsidiary water tank for storage. ￭On the contrary, with the decreasement in water temperature, the cooling water begins to shrink which causes vacuum inside the water tank. Then, the water tank cap string will open and let the cooling water flow from the subsidiary water tank to the water tank, so as to keep the water level balance. 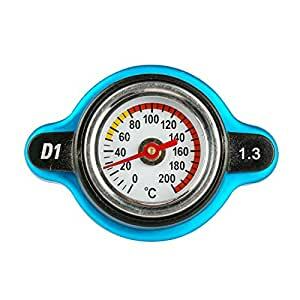 ￭D1-SPEC safety water tank cap with temperature gauge can show you the accurate water tank temperature without launching the engine.And the silicone inner stopper helps enhance the heatproof function and the compactness of the tank cap!